Find a Word and... It's Yours! My Word! 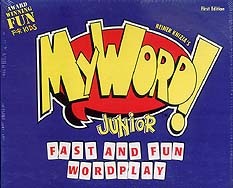 Junior is the first word game that plays like a party game! Quickly search for words while letter cards are dealt onto the table. The first player to call out a word using at least three cards - wins those cards. Fast and easy to learn, My Word! Junior is the perfect game for kids, families and friends!